Miniature. Ink, tempera, and gold on vellum. Leaf: 490 x 340 mm. Initial: 120 x 110 mm. Historiated initial M on a leaf from a Gradual. Text and music: Introit, Common of the Apostles. The twelve Apostles are grouped in three rows of four, split by the central stroke of the initial. Most prominent are Peter and Paul at the top, respectively with double keys and sword. Both are dressed in bright orange robes, whereas the other apostles wear robes of various colours: blue, green, and ochre. Not all halos are in gold, but rather vary in colour. While Peter makes a gesture of blessing and Paul somewhat solemnly holds a book, the other figures are gesturing in discussion. Three of the disciples are depicted as young men. The illuminator, Jacobello di Salerno, signed his first two known choir books as the copyist of the text and music, as well as the illuminator. These two codices (one now in Los Angeles, J. Paul Getty Museum, the other in Brussels, Conservatory) were made about 1270 for Dominican use in Bologna and locate the artist in that city at that time. Both volumes exhibit similar characteristics in the particular form of the letters, the blue ground, and the foliage extensions as in the illumination of the present leaf. 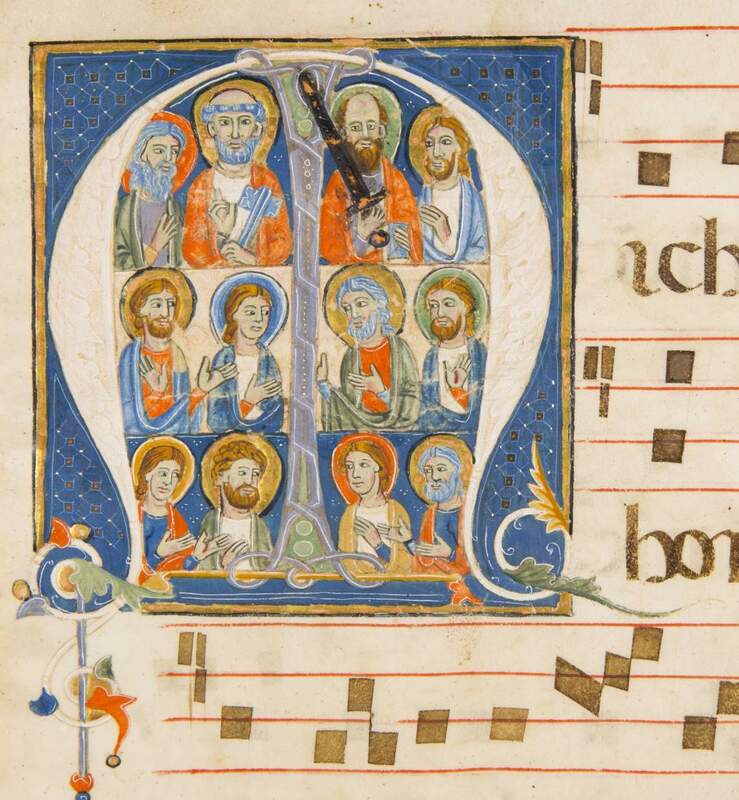 The illuminator presumably was trained in Bologna in the context of the illuminators who were involved with illuminating series of choir books for various Dominican institutions.